Percy Main Amateurs’ promotion was officially rubber stamped at last week’s Northern Alliance AGM. The Villagers will take their place in the league’s premier division this coming season after an absence of only one campaign. AFC Newbiggin, who finished runners-up in the first division table, will also make the step up, while only Hebburn Reyrolle will be relegated from the top division due to the early season demise of Stocksfield last time around. 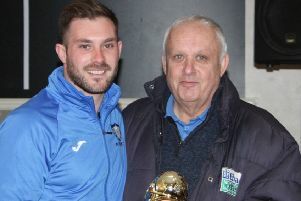 Main were also presented with the Northern Alliance’s ‘Sportsmanship Award 2014-15’ at the meeting attended by all of the league’s clubs, following the side’s withdrawal on principle from the Bill Gardner Trophy semi-final towards the end of last season. The squad have now commenced pre-season training, with testing sessions run by the management team planned up to the first friendly at home to Longbenton on July 18. Sixteen of last season’s championship winning squad have already signed up for the new campaign, while the return of Dean Ellis from Bedlington Terriers, a former Young Player of the Year, will strengthen competition for places within the team’s midfield. Several more new signings are expected to follow in the coming weeks. On Sunday (June 28) Percy Main will host their own AGM at Purvis Park starting at 6pm. All those interested in the club’s current standing, with exciting plans in the pipeline for development and progression during the following months, are invited to attend.